Who says you can't wear pearls with everything? 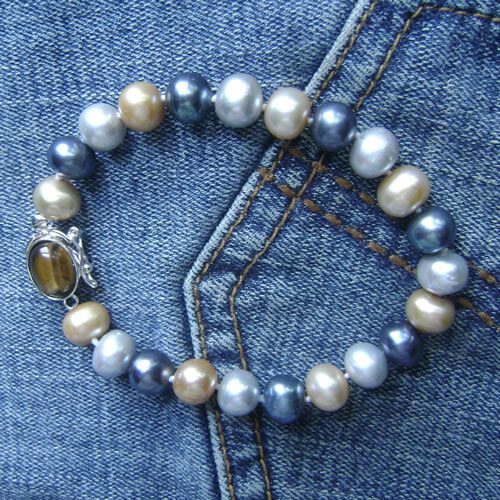 This gorgeous genuine freshwater pearl bracelet is perfect to wear with your jeans. 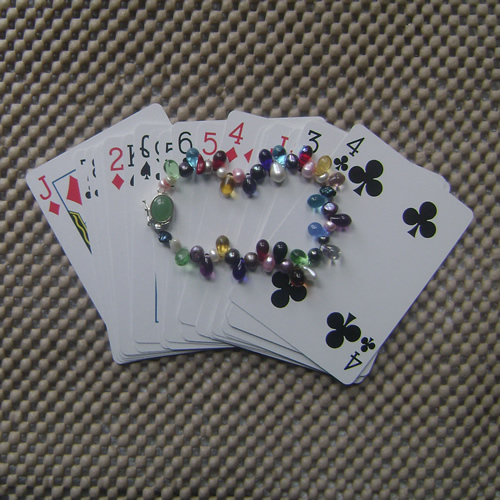 This 8-9mm potato pearl bracelet is designed with gold, silver and peacock color pearls. They compliment each other beautifully. The pearls have a great luster and do include some rings or ridges on them. The bracelet is hand knotted on silk thread between each pearl for extra security. The 8x10mm sterling silver tigers eye cabachon clasp has a safety clasp. For your special custom design length please call for pricing. 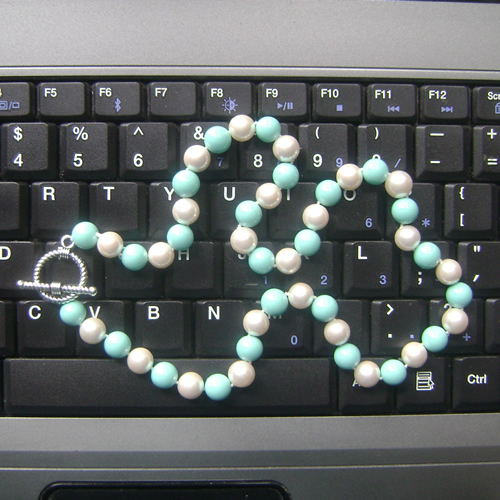 This pearl necklace is designed using turquoise and cream 8mm shell pearls. They have a wonderful luster and are perfectly round. The 16mm silver tone stylish toggle clasp is used for easy fastening. 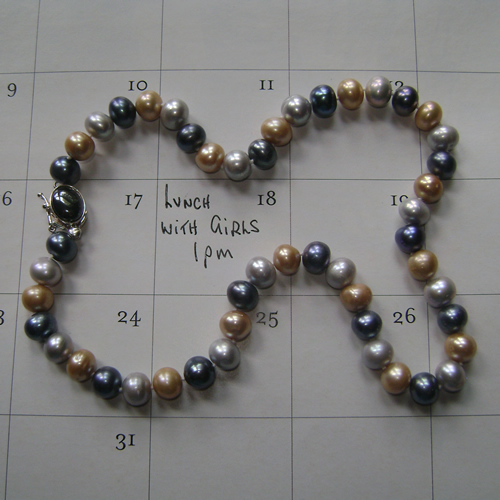 Hand knotted between each pearl for extra security this necklace can be worn everyday whether at home or at the office. Wear this necklace with the clasp at the front for a very fashionable look. This necklace can be built to a custom length of your choice. Please contact Lynne for pricing. This beautiful 8-9mm genuine freshwater potato pearl necklace is designed using three colors of pearls: gold, silver and peacock. The pearls have a high luster with some natural rings and ridges on them. The combination of these colors allows you to wear this necklace for everyday wear. The necklace is individually hand knotted between each pearl for extra security using silk thread. The 8x10mm sterling silver hematite cabachon clasp with safety catch makes this necklace a favorite for the ladies. Perfect for all skin tones. This multi color bracelet is designed using 4-6mm genuine freshwater pearls in all colors and shapes and a 9x6mm jewel toned teardrop glass bead in between each pearl - giving this bracelet a multitude of colors. The bracelet is hand knotted on silk thread and the sterling silver 8x10mm jade cabachon clasp has a safety catch for extra security. This is the perfect bracelet for everyday wear. This bracelet can be custom designed to your own length. 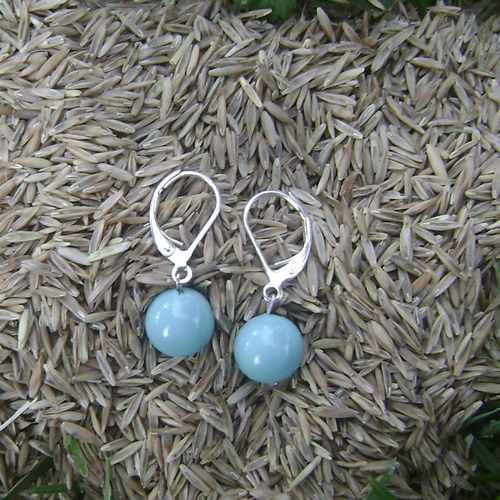 Pearl earrings can be worn everyday - even when gardening. These single drop 10mm blue shell pearl earrings have a very high luster with no blemishes. They are designed using the sterling silver lever back for extra comfort that can be worn all day. Perfect for all skin tones. Pearl earrings can be worn everyday - even in the kitchen cooking your favorite meal. 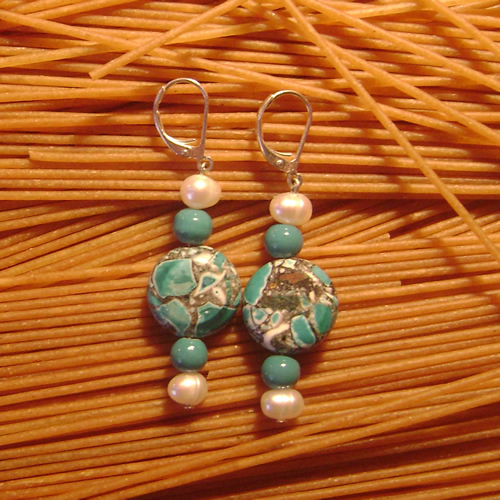 These gorgeous sterling silver lever back 1½" drop earrings are designed with 6mm white genuine freshwater potato pearls, 6mm turquoise color glass beads and a 13mm magnesite stone. This multi drop design pearl earring is very flattering to the face and looks fabulous on all skin tones.